South Korean cryptocurreny exchange called B-Trade announced that it will be starting its Bitcoin price estimation service. 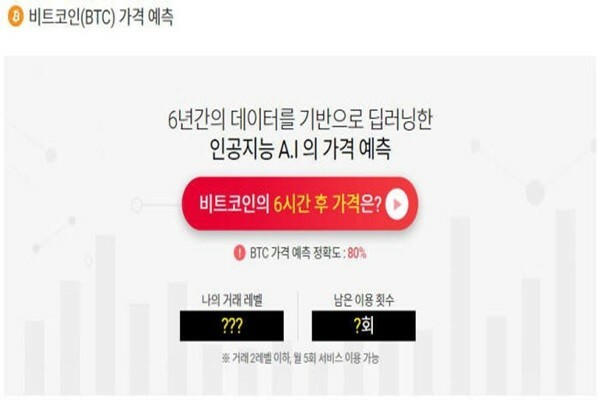 This service estimates Bitcoin price through Deep Learning and AI (Artificial Intelligence) and it is a first price estimation service by a South Korean cryptocurrency exchange. This service has AI analyze market values of Bitcoin for past 6 years through Deep Learning technology and estimates price of Bitcoin in 30 minutes, 6 hours, and 24 hours. Besides this function, it also checks fluctuation rate of market value, price range, and accuracy in price estimation. Any member who completed authentication process with B-Trade can use this service 5 times per month for free. Members, who have turnover of more than $44,600 (50 million KRW) in the past 30 days, can use this service without limits. B-Trade is expecting that this service will help investors to decide when to buy and sell Bitcoin. This service is also expected to be used as an index for cryptocurrency markets that have huge variability. "We have created this service to provide an optimal environment for investors." said a representative for B-Trade. "We are planning to expand this service to other cryptocurrencies depending on reactions from people who use this service."